It was surely an Epic feat. 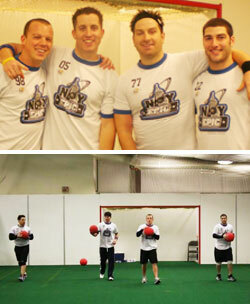 In August of 2008 New York Epic Captain Rob "hometown" Immel decided to research world records in the dodgeball category. The record for "The Longest Dodgeball Marathon" was non-existent and the opportunity was available. After months of planning and communication with Guinness World Records, The stage was set for the record attempt. The Epic was going to start playing around 7:30 against volunteers and teams that were in support of their efforts. At 9am teams were to come in every hour and play for one hour straight. The team that were able to beat the pro slingers the most times in their hour slot, would take a prize of $1,000 home with them generously donated by Booty Camp Fitness. The amateur teams had one more player and would be playing a very tired and worn team. December 19, 2008 Rob Immel, J.P. Richards, Oren Gal, and Mark Rabideau took to the dodgeball court with dreams of making it into the great book. At 7:40 the young men huddled up and gave some encouraging words and with a loud "1,2,3 EPIC" their epic journey was underway. The four men would be playing against five others and their plan was to take it easy for the first leg of the attempt in order to have some strength and endurance left over to make the record official. That's not how it started. The professional players were so excited in to be actually attempting a world record that they played like it was the finals at the Dodgeball World Championships in Las Vegas. Sacrifice Fly attempts by Rabideau, intense blocking and attacking skills by Richards, diving catches by Gal, and of course some Hometown Windmills by Immel set the stage for a very exciting and grueling night. The athletes took their first break at 1:40am. Guinness' rules allow a five-minute break earned for every one hour on the court, and this time can be banked. They took about a 20-minute break to stretch out, switch wristband and undershirts, and they were back on the court. Around 3am things were difficult. Their arms were dragging, the Gatorade, cliff bars and almonds just weren't enough fuel for the grueling sport, but the pros pressed on. They knew that giving up was not an option. At about 7am after battling fresh arms and energetic players on the other team, the NY EPIC found their burst of energy. They found themselves surrounded by fans on the outside of the plexiglass that surrounded the court. Fans got up early in the morning trudged through the upstate NY snow, just to catch a glimpse of history in the making. This helped the pros realize why they were in there and what they had to do. At 9am with the tournament about to officially beginning and new teams coming in to win the prize money the EPIC took another small break to stretch out or even close their eyes for 10 minutes. The first team that came to play came to win. The rest of the teams had the same attitude. Each team did not care how sore, tired, bruised, or bloody the EPIC players were. Playing a player down was tough but the EPIC players rose to the occasion and played greatly. They played so well as a team and covered each other as if there were six of them. Teams came confident and left dejected. Each team had a great time and got a lot of playing in. Each and every team applauded the professional player's drive and physical endurance. Many teams came with substitutes and were very tired and sore after 1 hour of play against the pro dodgers. After the tournament was through, the winners were of TEAM HOOD out of Boston. It was in the 24th hour of play and the team that has played together for three years was able to win 14 of the 31 games in their hour. The countdown from ten began and the faces of pure joy were seen on the NY player's faces. They have done it. After 24 hours of straight dodging, throwing, jumping, spinning, and winning, they carried their tired bodies off of the court. Each and every player was welcomed out with hugs, high-fives, and handshakes. It was a feat to be proud of. The players each signed the "24" sign, posed for some pictures, and looked at each other as if to say, "we actually did it!" During the event many newspapers and television crews were there to capture the marathon and spread the word that a world record was to be set in their area. Many friends, family, coworkers, fans, and community members stopped by to give their support and cheer on their favorite player. Money was also raised for the "Make a Wish Foundation", a favorite charity of the NY EPIC. As of January of 2009, Guinness is looking at the EPIC's claim and making sure the record actually stands, but there is no way to dispute it. These incredible athletes played one of the most physically demanding sports for 24 hours and 2 minutes straight. A truly EPIC feat.